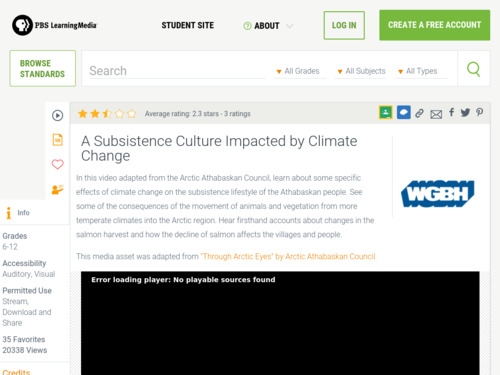 Background essay on the Athabascan people and discussion questions are provided on the PBS LearningMedia site. Observations from scientific studies and native people of the Arctic on how changing climate is affecting their lives and the ecosystem they depend on for sustenance. Short introduction of how changing climate is impacting the subsistence culture of the Athabaskan people living in the Arctic. Concrete example of the effects of climate change rather than in the abstract. Easy to download or watch online.